Model Primary Schools 5 days Training to the identified English Teachers working in MPS -conduct of District level Trainings -Certain instructions issued - Reg. AP R.C. No.02/B/C& T/SCERT /2016-2 Dated: 24.08.2016. AP Model primary School English Teachers Training from 01-09-2016 to 17-09-2016. Ref : Progs. RC.No. 02/B/C&T/SCERT/2016,dated.25.06.2016 of this office. The attention of the all the Principals of DIET colleges in all the 13 districts of Andhra Pradesh is invited to the ref. read above that, wherein identified DRPs were trained at RIE, Bangalore. Now, it is decided to train the identified English teachers working in 3886 Model Primary Schools across the state in English language to acquire the desired skills in teaching English. 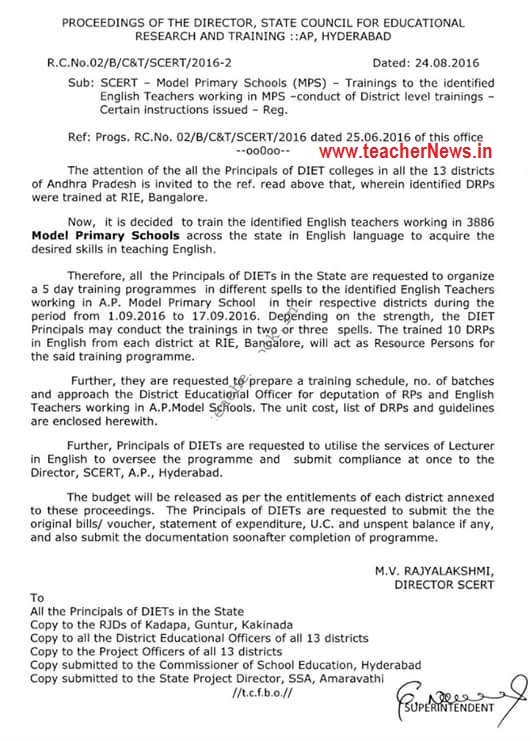 AP Model Primary School Teachers English Training Programme Instructions.